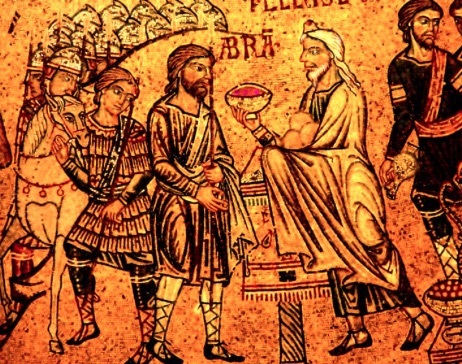 The name of Melchizedek isn’t often mentioned among Christians. And there’s no mystery about that. Melchizedek makes only one actual appearance in the Bible, in Genesis 14:18-20. Think about this. Before God had begun to fulfill His first covenant (or first testament) by making Abraham and Sarah the parents of Isaac, the foundation on which God would build His people Israel, there already was, at Jerusalem, a king and priest of God. Now, this is interesting. Among the descendants of Abraham, there were priests and then there were kings. While Israel’s kings were called to be submissive and trusting toward God and to honor the priests, except in the case of pretenders later in ancient Israel’s history, Israel never had people who were priests and kings. Such a combination of eternal and earthly power could only be handled by someone who, because of their humble trust in God, would resist the temptation to be an autocrat, a dictator, or self-glorifying conqueror. Melchizedek apparently was the kind of person who could resist those temptations. When Abraham met Melchizedek, he clearly understood himself to be in the presence of someone who was a priest of the very God Who had called him from the comforts of his home in Ur, willing to wander to the new home that God promised to show to him. That’s why he humbly received bread and wine from this priest and king and, in response to God’s grace, gave Melchizedek a tithe, ten percent “of everything” he owned. This is the last known appearance by Melchizedek on the earth. So, what happened to his royal house? What happened to his priesthood? Our second lesson for this morning, Hebrews 5:1-10, provides some answers. Hebrews, you'll remember, is a book of unknown authorship. We do know that it’s a sermon by a Jewish-Christian to a congregation of Jewish-Christians who are being tempted, under pressure of Roman persecution, to renounce Christ. The preacher of Hebrews encourages his fellow Jewish-Christians to not desert the hope they have in Christ. Christ, he says, is the culmination of all of God’s promises of forgiveness and new life given to their ancestors and through them, to the world. Let’s take a look at what he has to say today. The high priest of Israel, who had been at the temple in Jerusalem before the temple was destroyed and the priesthood decimated in 70 AD, several decades before this sermon was given, acted as a mediator between God and God’s people. The high priest was called to make sacrifices for their sins and to gently counsel people with God’s Word. He was able to do this because, as a human being himself, he understood the pressures, joys, and temptations that we human beings face. But the high priest could only do this because he acknowledged his own sins before God and offered sacrifices for them. The preacher in Hebrews says that anyone who would presume to take the office of high priest would not be qualified for it; it had to be conferred on them by God. I think that even today, there’s a principle for us: Anyone who wants to have a position of authority or power in the Church--be it pastor, bishop, church council president, congregational officer, church council officer--ought to be viewed with a certain amount of skepticism. When the people of the Church, after a season of prayer, felt led to ask an often reluctant but faithful person to respond to God’s call, that’s the person God is likely calling. One of the things I love about this congregation is that we don’t ask any elected person to serve in positions of responsibility unless there has been prayer and a discernment of their call from God. We don’t use the spaghetti method to recruit candidates for church council, for example: We don’t just throw up a name and see which one sticks. Like the high priests, those who hold responsibility in today’s Church need to be believers who live in daily repentance and renewal, who have no notion that they’re anything other than sinners made saints by God’s grace through their faith in Christ. We are blessed to have elected leaders like that at Living Water. And it’s my observation that we take the same care in selecting people for appointment to positions in the congregation. Here, the preacher of Hebrews cites two different psalms. There are different kinds of psalms. Psalm 35, for example, is an imprecatory psalm in which the psalmist asks God to go after his tormentors. In Psalm 51, David confesses his sin and asks God to give him a clean heart. In our lesson from Hebrews, two psalms, Psalm 2 and Psalm 110, are cited. These are both royal psalms. They were written to celebrate the anointing of God's king in Israel. royal pslams. A king of Israel was referred to as the Anointed One, in the Hebrew, Meshiah, Messiah and in the Greek in which the New Testament was written, Christos, Christ. Jesus is also a king, the King of kings. God has made Jesus both our High Priest, able to understand our weaknesses because He’s withstood every test and temptation that we have in life, and our King, Who has conquered death, darkness, and the devil to give all who let Him be their Priest and King, life with God that never ends. All of this Jesus did for you and me so that, even now, at this very moment, sitting at the right hand of the Father, He is able to be our understanding priest and the King Who has conquered our darkness and death by giving His life for us. What does Jesus ask of us in return? Everything you and I might be tempted to put our trust in in this world--kings and presidents, money, security, and possessions, health and success, the power of every bit of it will give out at the grave. 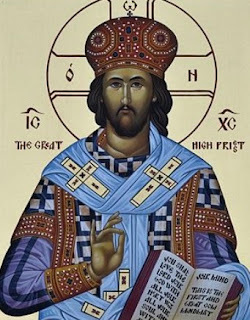 Jesus, our High Priest and King of kings, Who comes to us amid the battles of our lives with bread and wine, His body and blood, has conquered this dying world and its futile ambitions for us. He and those who trust in Him and His high priesthood of love are all that will survive and thrive for all eternity. May we always be counted among those who trust in Christ alone.